The Ladewig family welcomed a new member today. 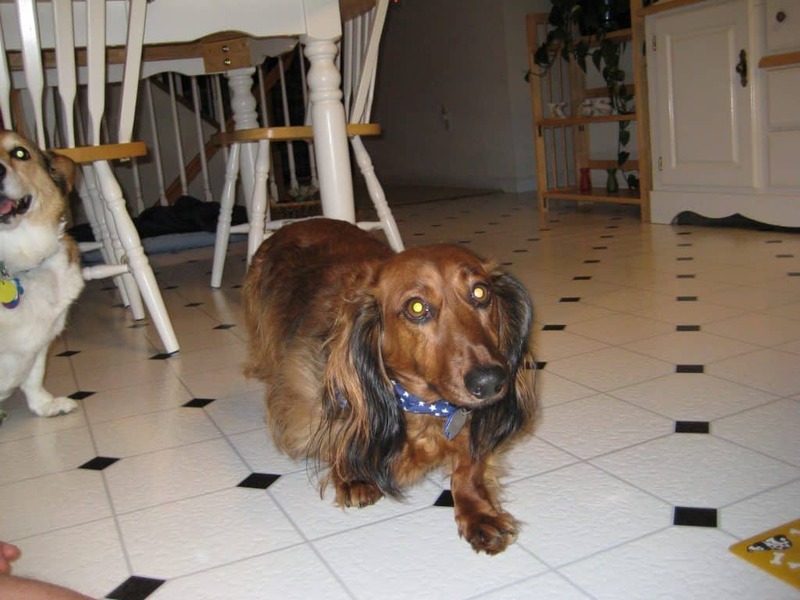 We adopted Shaggy, a four year old long-haired dachshund, from the Humane Society of Missouri this afternoon. You can see more photos online in the Welcome Shaggy album. First off, Shaggy wasn’t our first choice for a name, but that’s the name he had when he came to the shelter, so who are we to confuse him while he learns a new name? We’ve been interested in adding another dog to the family for a while. Collen will be nine this year, and we’ve thought that it would be good for him to have a younger companion. Every day I receive an email alert from the Humane Society listing the dogs that are available for adoption and that match my criteria. 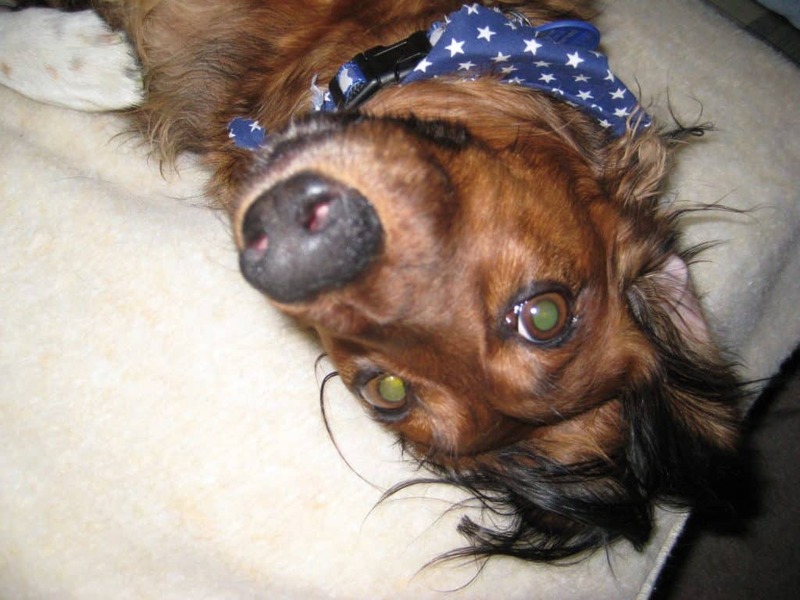 I saw a cute long-haired dachshund over the weekend, and thought I’d check him out. It took a couple days, but I finally made it there during lunch today, fully expecting him to have already been adopted. But as luck would have it he was still there. He seemed cute and well-behaved, and his background info provided by his former owner was very positive. Not a single bad mark. This seemed too good to be true, so I asked to see him, and off we went to a “Get Acquainted” room. He came right up to me and sat in my lap and let me rub his belly. He reminded me of Collen, very laid back, so I told them I’d be back with Collen in a few minutes so they could meet. A short while later Collen and I were directed to an outdoor pen where we waited for Shaggy. The adoption counselor brought him out and after a couple rounds of sniffing each other, they basically ignored each other. As it turns out, ignoring each other is about as good as you can hope for. Since the meet and greet went well, I paid $25 for a24 hour hold, then called Kristin to let her know what I was up to. After work we both went over and met with Shaggy and the counselor. We agreed that he seemed to be a perfect match for Collen and was too good of a dog to pass up. So we jumped in with both feet, filled out the paperwork, paid the adoption fee, and we were off with our new dog. When we arrived at home, I went in and let Collen out into the backyard. Kristin followed with Shaggy shortly thereafter and needless to say, Collen was a bit perplexed at this new visitor. Since it was pretty hot and humid here, we didn’t stay outside too long, and once we went inside, the exploration and chase began. Shaggy sniffed out every nook and cranny of the first floor and Collen was hot on his heels trying to figure out what he was up to. When Shaggy jumped up on Collen’s ottoman, an hour or so of barking began… all of it from Collen. Collen has a full voice and uses it quite a bit when he meets up with other dogs. Shaggy ignored him and continued to explore, and eventually things settled down. Both dogs were pretty exhausted, and besides it was time to make dinner. Shaggy needs to lose five pounds or so, and from the way he hung around in the kitchen, we think a steady supply of people food in his previous home may have been to blame. He’s going to learn pretty quick that human food very rarely makes its way to the floor or dog dish in our house! Between that change and walks around the neighborhood, we should get him slimmed down. Wish I could say the same for me! The rest of the evening, the two boys stretched out on the couch and soaked up tummy rubs and attention from both mom and dad. We’ll see how day two goes tomorrow as I work from home so I can keep an eye on the two of them. I, too, walk dogs at HSM in Maryland Heights. Shaggy IS as wonderful dog! Have fun! Cute dog. Need to change the subhead on Ladewig.com to “dogs”!